Gertrude Stein (1874–1946), one of America’s most famous writers, lived in France from 1903 until her death. She experimented radically with language and reached across the arts, befriending young writers like Ernest Hemingway and artists such as Henri Matisse and Pablo Picasso. This exhibition tells five stories about Stein and the sensorium of seeing, taking seriously the writer’s repeated insistence that eyes “were more important than ears.” Story one, “Picturing Gertrude,” presents portraits of Stein, who modeled freely for artists. The second story, “Domestic Stein,” looks at the lesbian partnership of Stein and Alice B. Toklas, focusing on their distinctive dress, home décor, hospitality, food, and pets. “Art of Friendship” explores Stein’s relationships and collaborations after World War I with the neoromantics, a circle of international artists who were young, male, and gay. “Celebrity Stein” tells of Stein’s triumphant return to the United States in 1934–35, and the last story, “Legacies,” explores her ongoing presence in contemporary art. Stein has always provoked passionate responses. She paraded, even celebrated, her contradictions. Her literary innovations were radical but her political beliefs conservative. She was a lesbian who preferred the intellectual company of men. She was born and raised a Jew but did not give Judaism a central place in her public identity. A self-acclaimed genius, she preferred talking to the man in the street rather than those in power. She was an expatriate who wanted to be famous in her home country. She was beloved but also feared and disliked. 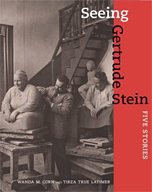 “Seeing Gertrude Stein: Five Stories” explores this complex and fascinating woman. For an in-depth look at the life of this artist, collector, and distinctive style-maker, see the companion book to the exhibition: Seeing Gertrude Stein: Five Stories by Wanda M. Corn and Tirza True Latimer. Copies are for sale at the National Portrait Gallery's museum shop (202.633.5450) or through University of California Press (hardcover, 416 pages, June 22, 2011, $45.00).